The Royton Lives Through the Ages group, part of the Royton Local History Society has produced a series of walks around Royton which take in the historic places of interest within the Town. 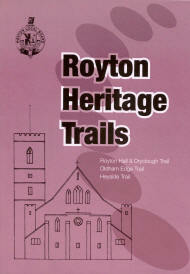 The first two walks are currently in booklet form and can be obtained from Royton Library or download it below. The first walk is 1.4 miles (2.3km) long and is wheelchair friendly. N.B. To suit wheelchairs users the route described is not the shortest. 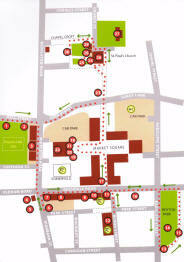 It covers the To wn Centre area and the text gives historic details about each site as you pass it. 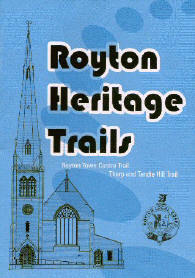 Royton Hall, the Town Hall, the Library, Royton Park and St. Paul's Church are just a few of the places mentioned. The second walk is 4 miles (6.4km) in length and is not suitable for wheelchairs. It mainly covers the Thorp and Tandle Hill areas but starts and finishes in the town centre at St. Paul's Church. Again the text gives historic details about each site as you pass it. Spaw Cottages (once Royton's Workhouse), Thorp Hamlet, Tandle Hill Park, Roy House (the former Scattered Homes), Park Lane House and the Hope & Anchor Pub are amongst others included in this interesting walk. A second booklet which covers three different walks once again shows a clear map and dir ections on how to travel from one site to the next with the points of interest being clearly marked. Also included, where possible, are historic photographs of the site. The first walk is 1.5 miles (2.36km) takes in areas around Royton Hall and Dryclough. It passes several Mills including the Vine and Delta, SS Aidan & Oswald Church, St. Anne's Church and Dryclough Manor. The second walk is 2.4 miles (4.2km) and covers Oldham Edge. It passes several pubs including the White House at the highest point. Please be aware that some of this walk is on a dirt and rock path. The third walk is 0.8 miles (1.3km) and takes in Heyside. This walk is considered to be wheelchair friendly but there are 2 areas with no dropped curbs. It passes the Quaker Burial Ground, St. Marks Church, and Hey Cottage. The booklet can be obtained from Royton Library and Oldham Local Studies and Archives Centre or can be downloaded by clicking below.